The earphones function quite typically for a TWS product. The case is integral, functioning to power on the earpieces upon removal and charge/power off when stored. Three LEDs on the front of the case indicate remaining power of each earpiece and the case itself. The case provides an additional 3 charges providing a total 14hrs of runtime. The earbuds themselves are quoted to last for 3.5hrs, a figure that was reliably achieved during my testing and a fairly average figure for a TWS set. 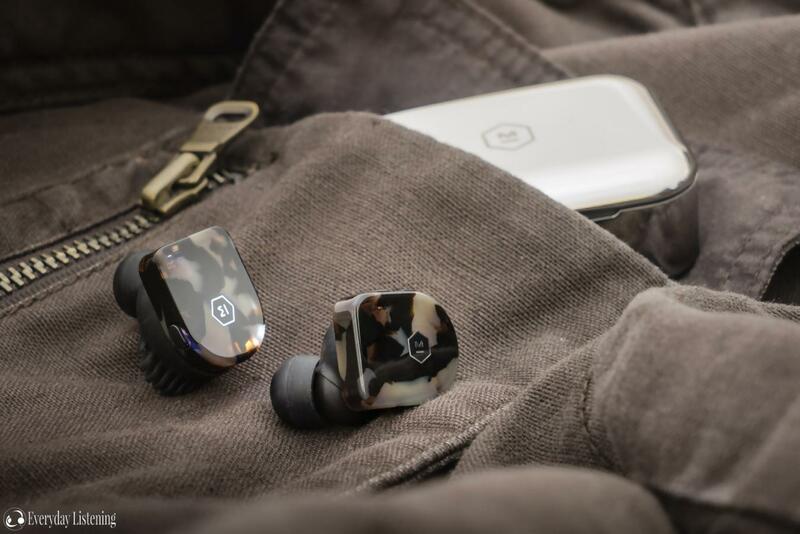 The earpieces slot into the case and are held down by a magnetic lid with satisfying action. Pairing is simply and easily achieved by holding down the MFB on the right earpiece once they have been turned on. Once paired, they quickly auto-connect to the last paired device when removed from the case. Audio cues are provided to denote connection and power status in addition to remaining battery. The earbuds are intuitive with volume buttons on the left earpiece and a MFB on the right. They have no additional features nor is there an accompanying smartphone app. During daily use, I didn’t find myself missing additional features and did find the button-based controls more reliable than and just as intuitive as the touch-based controls found on most TWS earphones. The MW07’s support Bluetooth 4.2 including Apt-X. Connection quality was rock solid and I experienced zero dropouts between the two earpieces during my months of testing. The earpieces also maintained a very reliable connection to my Pixel 3, experiencing no dropouts or pauses though very rarely some stuttering did occur in high interference environments. Each earpiece contains a MEM omni-directional microphone. The MW07 had the best call quality of all of my TWS in-ears in addition to good wind noise suppression. However, callers reported a slightly more distant sound than Apple’s Earpods. Range is also excellent, significantly better than my B&O E8’s which no doubt aids their reliability. Removing either earpiece automatically pauses the music. As the left earbuds acts as a slave to the right unit, some latency can be observed when watching video content, it isn’t unusable but is not ideal either. Still, this is an issue that affects the vast majority of TWS earphones besides a select few. In addition, this means that only the right earpiece can be used by itself as the left earpiece cannot be paired to a source. Though some may want for more features, it is refreshing to see Master and Dynamic provide such a simple, audio focussed experience free of gimmicks and superfluous features that can compromise usability.